Astronics Corporation (NASDAQ: ATRO), through its wholly owned subsidiary, Astronics Ballard Technology, introduced its new Wireless Aircraft Communications Server (webCS®) - the industry's first highly-integrated smart AID/server/router that enables aircraft operators to easily capture, record, and process aircraft data. With this data, flight crews gain valuable insight into the performance of the aircraft to help them make decisions that improve operational efficiency. In addition, an operator can transmit data off the aircraft for post-flight analysis using built-in cellular or Wi-Fi interfaces, or stream data in real-time when connected to an on-board connectivity system. The webCS greatly simplifies the process of adding data-centric technology to commercial and business aircraft. This single device combines functions that were traditionally performed by several separate components, reducing the equipment footprint, simplifying installation design, and eliminating integration issues, resulting in significant savings. The webCS manages multiple communication pathways and features a new low profile Wi-Fi and cellular antenna array as an integral part of the compact, innovative design. "Never before has there been a device so small that combines all of these capabilities into one seamlessly integrated box. 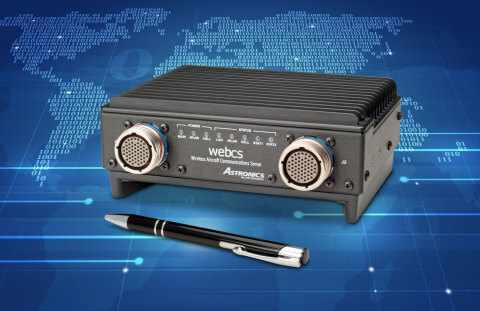 With the webCS, there is no need to worry about compatibility issues that can occur with add-on components or when connecting multiple boxes together," said Jon Neal, Vice President and General Manager of Astronics Ballard Technology. "Up until now, AID/server solutions have been built as closed systems that require the hardware vendor to deploy new or updated software. With our secure, open-architecture approach, we empower our customers to develop and control the software applications running on the webCS." The powerful webCS platform features enhanced computing capabilities that enable operators to securely access and process aircraft data for a variety of applications such as pilot electronic flight bag (EFB), cabin/crew, quick access recorder (QAR), maintenance, and other user-developed or third-party applications. The webCS is also a cost-effective communications server capable of providing real-time data processing for next generation technologies, such as integrating Internet of Things (IoT) technology into the aircraft. The webCS platform allows the operator to leverage and incorporate new technologies and innovations as they become available, maximizing their investment. Astronics Ballard Technology is the industry-leader for reliable avionics databus interface solutions. By producing quality, easy-to-use products available in a wide range of configurations, and providing free, world-class customer support, Astronics Ballard Technology has won the loyalty of aerospace, military and government users worldwide. For more information on the new webCS, visit www.astronics.com/webCS.